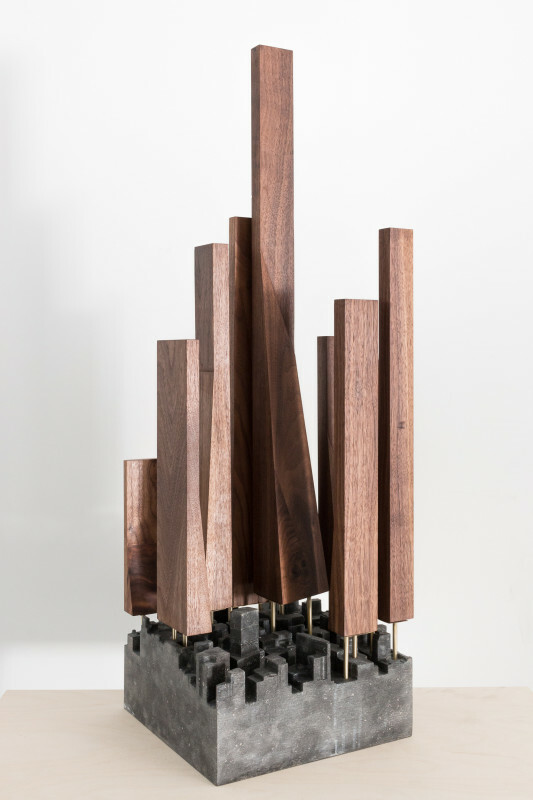 Twenty Five young American architects are taking on current significant issues facing the world in the 5×5 Participatory Provocations show at the University of Illinois at Urbana Champaign. With the aim of engaging with the public while still being provocative within the field of architecture, 5×5 argues for participatory criticism, or critical engagement through architectural practice. 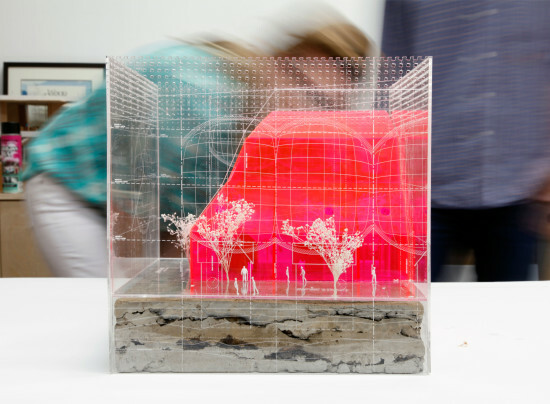 The curators posed five prompts for offices to explore one of through physical models. The prompts include; Droneports – contemplating the future of drone deliveries, Inve$tment Tower$ – the consequence of the construction of extreme luxury high-rises as financial investments, Lunar Resort – luxury tourism on the moon, NSA Community Branch – the fictional development of NSA community branches, and Trump Wall – the potential construction of an anti-immigration wall on the border between the United States and Mexico. The resulting models range from the playful to the austere, while questioning the current status of their prompted issue. 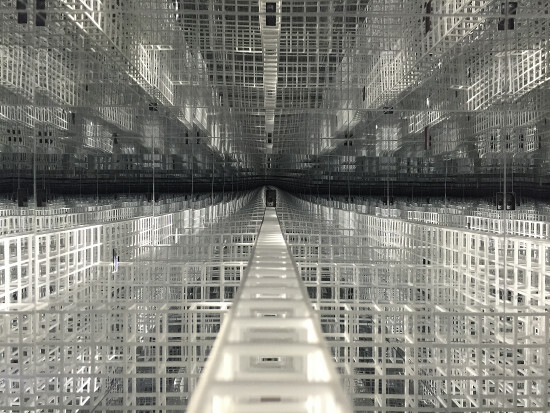 Abruzzo Bodziak Architects’s NSA Community Branch invites guests to “spy” on the model through cellphone peepholes, the interior revealing and endless web of space. PATH + Price Studio’s take on the same subject places an obtrusive metal building over a neighborhood intersection. 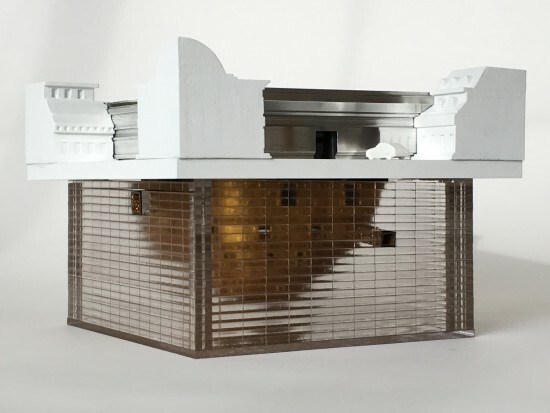 Below the ground of the model, the building is revealed to be iceberg-like, with massive underground information storage space. Brillhart Architecure’s Droneport model visualizes the very airspace companies like Amazon are fighting for as product delivery systems are rethought. Projects working with the Inve$tment Tower$ prompt also take to the air with slender supertowers. Both SPACECUTTER’s and P.R.O.’s Inve$tment Tower$ step over the cities below them with thin legs, physically expressing the separation of the rich from the rest of the city. 5×5 Participatory Provocations is curated by Julia van den Hout, founder of Original Copy, and co-founder and Editor of CLOG, Kevin Erickson a New York–based designer, and an Associate Professor in the School of Architecture, and Kyle May a New York-based architect and co-founder and Editor-in-Chief of CLOG. Sponsored by the University of Illinois at Urbana Champaign, 5×5 Participatory Provocations will be open through March, 4th 2016.